Martha Berry thanks Miss Hamrick for her visit and says that it made her feel much better. She says that she is still planning a trip to Florida and thanks Miss Hamrick again for her thoughtfulness. 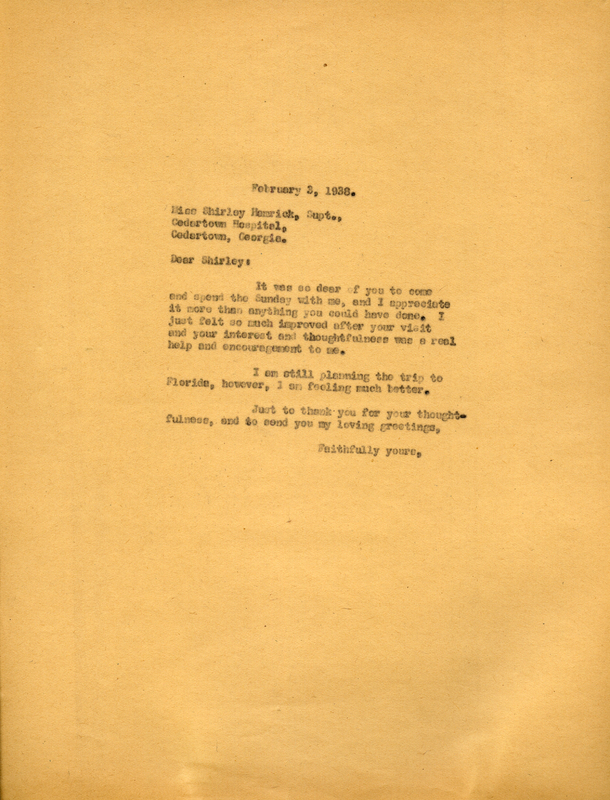 Martha Berry, “Letter to Miss Shirley Hamrick from Martha Berry.” Martha Berry Digital Archive. Eds. Schlitz, Stephanie A., Cassie LaJeunesse, Jessica Hornbuckle, et al. Mount Berry: Berry College, 2016. accessed April 18, 2019, https://mbda.berry.edu/items/show/14454.